Reports of climbable ice in the ravines has motivated Bob & I to head up the mountain and see what’s what. 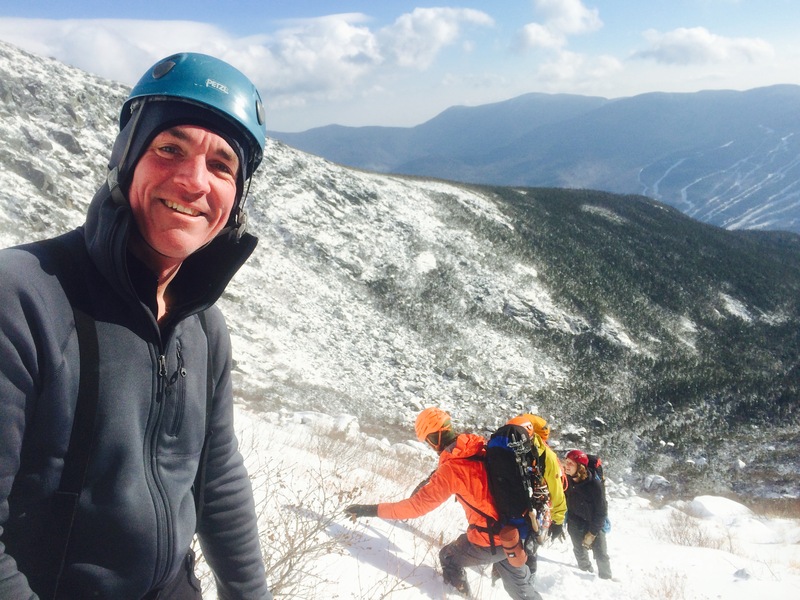 It has been a few years since I have climbed ice this early and we left our options open, not knowing if we would head into Tuckerman Ravine for a more mellow alpine cragging type day or commit to something more in Huntington Ravine. 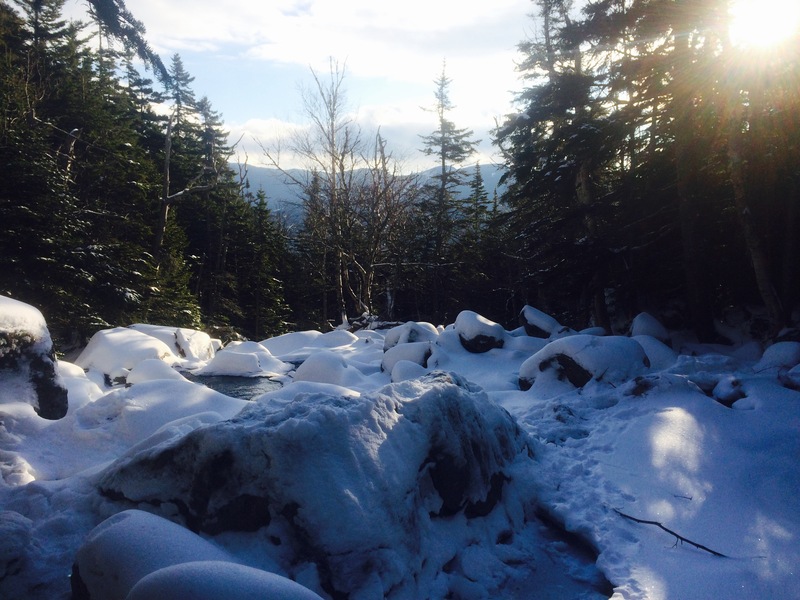 (7:30AM) We left Pinkham Notch Visitor Center and made our way up to the Huntington Ravine Trail. The weather appeared better than the forecast so we opted to head over to Huntington. 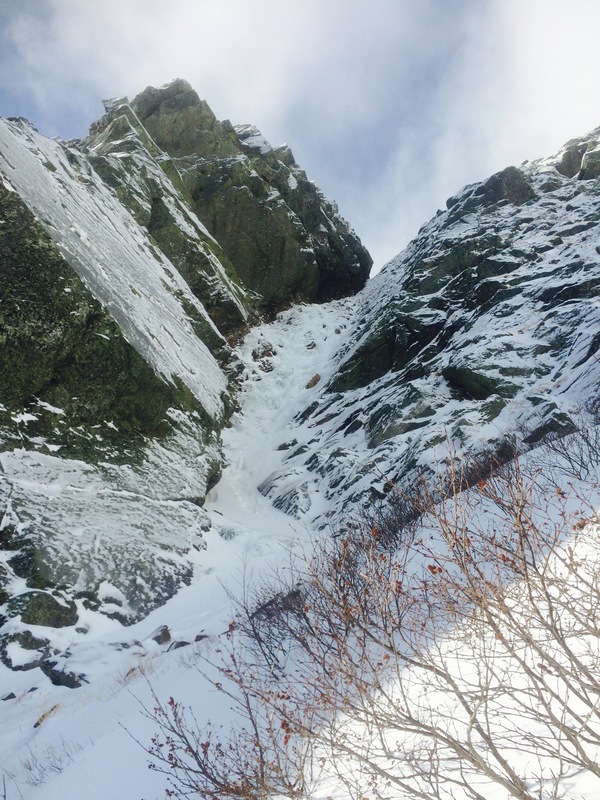 While I have climbed in Huntington Ravine dozens of times I have rarely taken the trail that breaks off from the Tuckerman Ravine Trail at 1.3 miles. It is usually faster to stay on the Tuckerman Trail until the “fire road”, then cut over towards Huntington, but today Bob and I relished the chance to enjoy a section of trail that we are not so familiar with it. We soon reached one of the river crossings that makes this option less preferable to the fire road choice. It took a minute to pick a line through the rocks and keep our feet dry. Someone got wet recently based on that hole in the above photo… careful on those early season crossings! We continued until we reached the fire road and followed that to the base of “The Fan”. It must have took 40 minutes to work our way up to Pinnacle. With almost no snow in the ravine and a half inch of verglas ice on every bus sized boulder the going was quite slow. Under and over and through we picked a line up through the Fan while a party of three followed suit. 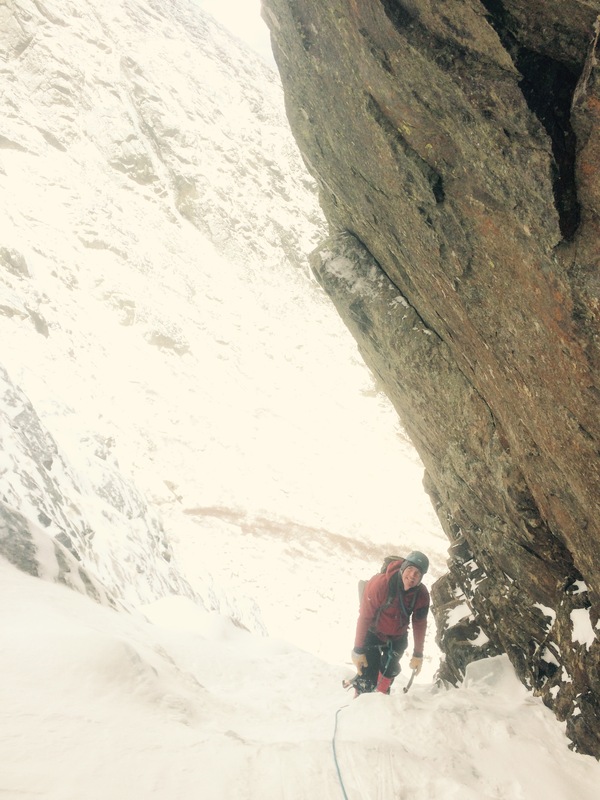 Pinnacle Gully looking good for November 20th! (10:10AM) I took the first lead and must say it felt great to swing the tools again. I could tell I wasn’t in the shape I usually am for climbing ice but felt quite solid… like riding a bike, you don’t forget. I placed 4-5 screws in 230 feet before reaching the 3 pin anchor above the steeper start of the route and put Bob on belay. He had to simul-solo about 30 feet for me to reach the anchor. I was amp’d to go again on the more mellow 2nd pitch and we fired that 220 foot pitch off before I stopped to bring Bob up. Bob took the last 100 feet and we were at the top of the gully by 12:30. After coiling the rope and “de-gearing” we starting picking our way up 300 feet to the rim of the ravine. Again, conditions are slow going this early in the season. (1:05PM), Alpine Garden Trail. I realize what a huge mistake not bringing micro-spikes was as Bob cruises along and I am stuck between bare-booting or technical crampons. Bare-booting works till the Lions Head where I put my technical crampons back on. The trail is nothing but rock and half an inch of glaze… really hard to move quick this time of year. We make it back to Pinkham by 3:30PM, 8 hours car to car, not too bad given the conditions. All I can say is I am amp’d up for this ice/ski season. I think it is going to be a stellar year, despite the warmth & rain that will hit us right before Thanksgiving the long range forecast is favorable for Thanksgiving Weekend and will hopefully set us up for a great December. Editor’s Note: This blog is getting a make-over! New URL, new theme, LOTS of product reviews, check out the new “Guide Tested” page, links to awesome climbing & back-country skiing websites, and more… so… if any of this type of stuff interests you maybe you subscribe at the top tight of the website? Maybe?